Arts For Life Asheville Program Director Annie Rogers recently caught up with William to talk about some notable moments so far from this year’s podcasts, to see what he has in store for upcoming shows, and to hear how he helped one Arts For Life student from the Middle East feel right at home in Durham. Annie: What inspired you to start Arts For Life Radio? William: Before working in hospitals, I spent five years as an elementary school music teacher. I started several classroom and after-school radio podcasts and produced around 100 shows, and they were all great hits with the kids and teachers. It was a way to integrate technology, music, reading, and public speaking skills into our classroom. Annie: What has the response to the podcast been so far? William: Arts For Life students and their families love the shows! 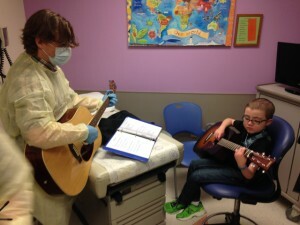 They like being able to share what they’ve learned with their friends and family outside of the hospital. Annie: What are one or two of your favorite moments from the shows so far? What highlights should people check out? William: All of the episodes are hits, but a couple stand out and make me laugh. I was an elementary school Spanish teacher for a while, and so I have a bunch of Spanish-language songs. However, when I get to work with students who are native speakers, they always teach me a lot about my pronunciation. I produced two episodes of Arts For Life Radio with my pal Raul, one with Spanish-language songs and then another episode with the corresponding English-language songs. I also love all the episodes with Haley, who has been on three times now. When she referred to herself as being “here on radioland” I smiled because I realized that she’d picked up on the magic of what we do. Annie: What can we look forward to in future installments? William: We did our first episode with jokes in February with my pal Jaylen, and it was a big hit! I’d like to have more jokes, and I’m planning on expanding the show to do short interviews with some of the nurses and staff that we see every day in the hospital. I’d also like to interview some of the Arts For Life staff, volunteers, and interns, which I think would be very interesting. Annie: How do you see this new platform influencing the way Arts For Life’s story is told? William: Arts For Life’s work with the visual art projects is great because it lets the kids take something home from their time in the hospital. With music, it is more difficult because you can teach a music lesson, but the kids might not have an instrument of their own at home. With Arts For Life Radio, the students get to “bring home” their work, just as if they had painted a picture. The radio podcasts are free and available to stream or download 24 hours a day, so they get to “keep” their work. Annie: You’ve been with Arts For Life more than six months now. What’s the most interesting thing a student has said to you? William: I had a student try to describe to me a type of stringed instrument he was interested in learning. I struggled with some guesses until I finally said, “Are you talking about an oud?” He lit up and said, “Yes! I want to learn the oud!” The instrument is kind of a Middle Eastern lute/mandolin without frets. I tuned the baritone ukuleles to a minor open chord and put some dots on the neck, and in about five minutes we had a pretty convincing oud jam going on! If there’s a North Carolina-style ukelele-turned-oud jam to be heard, you’ll hear it on Arts For Life Radio! Tune in to the episodes mentioned in this post and more here.